Search Results for "carpet feet"
Wipe Their Feet on the Beige Carpet. Feet in Striped Socks. to Walk on the Carpet. 1940s: UNITED STATES: vacuum cleaner on carpet. Feet get off bus. Sewing machine. a Man is Standing Bare Feet on the Carpet, and Wiggle Your Toes. the Man Wipes His Feet on the Carpet and Leaves. 1950s: Feet pace back and forth on carpet. Mans feet at base of rocking chair. Children sleep in bed. Dancing with socks. Close up of male and female legs in white socks dancing on the gray carpet. Four feet ticking off a rhythm. 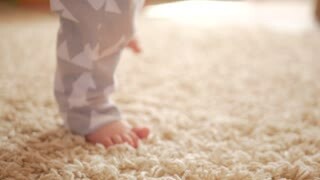 Close-up of a toddler's foot jumping on the carpet. Happy dancing baby feet. Slow motion. 100 fps. Close up view low angle of monster feet walking around on carpet in living room. Kherson, Ukraine - 20 September 2016: open, free, rock music festival feet of people walking on carpet, detailed view of crowd legs, chaotic movement of crowd. 1950s: Tip-toe feet and skirt walk on carpet to door, door closes. Man sits up in bed, listens, lays back into pillow with hands behind head, rolls eyes, stares. Kherson, Ukraine - 20 September 2016: open, free, rock music festival feet of people walking on carpet, chaotic movement of crowd, legs in concert hall. Young Woman Trying On High Heels In Shoe Store. a woman tries on a black suede high stiletto heel. feet step on the white fluffy carpet. Man legs in brown sneakers walking on blue carpet on long corridor in home interior. 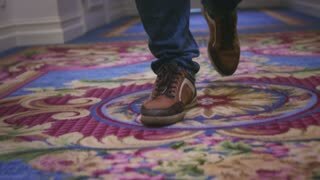 Close up man feet walking on long hallway in luxury hotel.